theFword: My All Time Favorite! Her fame goes around the world. You know her, I know her, we all know her. 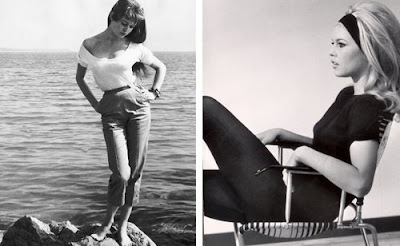 I could talk about her French origin (born in Paris, by the name Brigitte Anne-Marie Bardot). I could talk about her modeling career, or about her career in the European movie industry (great films like And God Created Woman where she played next to Jean-Louis Trintignant; Famous Love Affairs with the gorgeous Alain Delon). We could talk for days...my advice, goole her, or go straight to Wikipedia! O femeie adevarata care a facut istorie! And go to finetune.com and listen to her amazing french music! It is so cool! sorry to have been posting less comments during the school year! She was amazing, a natural beauty and full of charm.